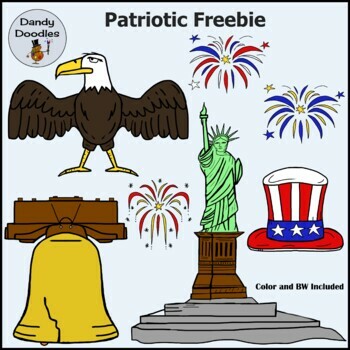 This freebie patriotic set features 7 color PNG images and the bw are included too. You'll get The Statue of Liberty, Liberty Bell, Uncle Sam Hat, Bald Eagle, and firework bursts. If you download and use it, I would appreciate feedback. Thanks! TOU: Feel free to use our clip art in your Teaching Products, classroom, Blog, or on your website. If you use our images, you must link back to our TpT Store somewhere in your document or on your site. To make it easier for you, we’ve included a button you may use to serve as credit given. It’s up to you which one you use. It’s in the download as a PNG image. Easy peasy to insert!